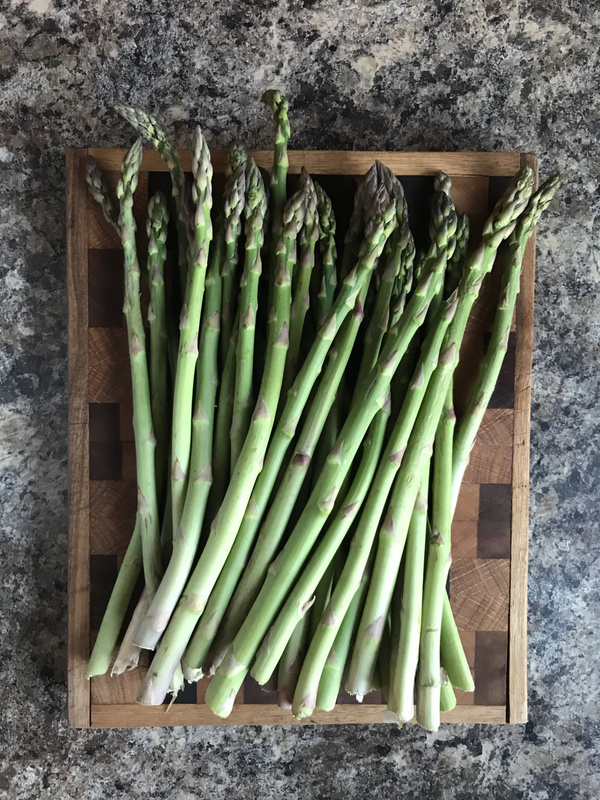 By Lauren Wells of The Leek & The Carrot where this essay was originally published and includes a delightful recipe for asparagus. I’ve had a lot on my mind lately. And really, can you blame me? With the significant ups and downs of our journey into spring, how could a farmer not have a lot on her mind as she eagerly awaits and anticipates when she’ll be able to work: when she’ll be able to till up soil and get a start on a season of lofty goals and even higher expectations. What is one supposed to do when they’ve set aside hours to be out in the fields, but are forced to stay indoors instead. I know everyone has been itching for spring this year. I know everyone everywhere would like the cold to just stop, the sun to come out consistently and to throw on some sandals for good (and I think perhaps finally we may have actually made it?). I know we’ve all been in this together, but trust me, it’s worse as a farmer. For me, spring means a mad rush of energy and I’ve been building towards it since late January. It’s the time of year when my body feels strongest– bending and planting and weeding and laying compost by hand. The sunshine fills me up like a plant and I feel ready to take on the world. The build up of late January to early April is like lining up for a race, eagerly preparing and strategizing and anticipating what lies ahead. And then this year, the race is starting an hour late with no warning or advanced notice. My body is literally abuzz with energy and anticipation standing at the start line waiting for the gun shot that will tell me it’s finally time to go. Luckily, learning to wait isn’t anything new. In addition to waiting for the snow to finally stop falling and melt from our fields, my dear Carrot and I have also been waiting to become pregnant: a journey that feels equally powerless and beautiful. Over the last couple weeks, instead of traipsing around the house wondering what farm task I should do to get ahead, I have spent time watching movies with my husband, taking bubble baths, reading cookbooks cover to cover, grabbing cups of coffee with old friends, and embracing the suddenly languid nature of a time of year that is almost never calm. Instead of losing sleep over every friend and acquaintance who gets pregnant (what feels like the minute they decide to try), I’m trying to take this time to get my know my body in ways I’ve always neglected, planning grand trips with friends and dreaming of the adventures we’ll have until that day comes for us. For several weeks this spring, I didn’t know when our season would begin. Just like I don’t know when we’ll get pregnant. And even now that I know the season will begin in earnest tomorrow, I don’t know what our season will look like and if it will be as successful as we’d hoped given the late start. I also don’t know what our family will look like and if it will be as large as I’d always imagined given the late start. Both will be nothing like I imagined and absolutely everything I imagined. Both will be flawed and difficult and also absolutely perfect. In other words, things will be what they will be regardless of whether or not I twist myself in circles wondering so I’ll do better to embrace what is and celebrate it all as it comes then to keep on wondering. And really, who couldn’t take a few lessons in relinquishing control and finding patience in the things we can’t define? Despite the pain and tears I’ve felt throughout this process, I’m immensely grateful for this journey. Learning to let go and find peace, calm and joy in the spaces once filled with stubbornness and superfluous determination is a blessing I never could have asked for or known how much I desperately needed. Not that I’ve got it all figured out. I’m just one step further down this path of imperfect like everyone else and even with all this talk of patience, I still bought a bunch of organic asparagus from Mexico because sometimes I too just can’t wait.